Alexa, what ID do I need to vote? 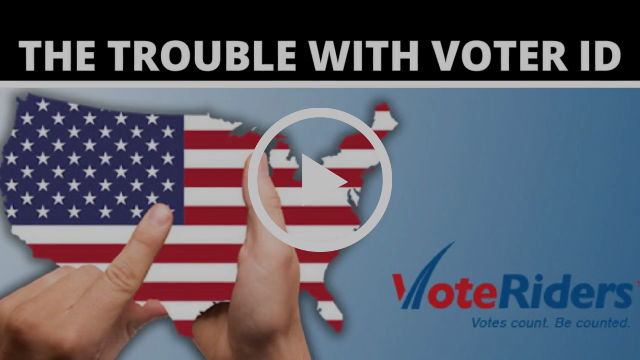 Over 25 million eligible voters lacking the right Voter ID may be prevented from voting. And getting an acceptable ID in thirty four states with Voter ID laws is both confusing and difficult. VoteRiders offers voters a free helping hand in understanding Voter ID requirements and how to get their own ID. This non-partisan, non-profit 501(c)(3) group, is dedicated to ensuring that all eligible American citizens can vote. Help is provided through a toll-free helpline and free wallet-sized Voter ID Info cards that summarize voting requirements by state. VoteRiders extends its impact by partnering with with voter registration groups, food banks, churches and neighborhood canvassing operations. Providing customized support and mass education to millions of voters is both expensive and difficult. But, this challenge isn't unique to politics. Businesses widely use Chatbots to serve customers with fast, personalized responses while slashing their call center costs. Many consumers prefer to handle their customer service issues by chat rather than over the phone according to a Nielsen study commissioned by Facebook. Chatbots can also assist voters through Facebook Messenger and Amazon Alexa. VoteRiders and DemLabs have teamed to apply Chatbots for customized voter assistance. Voters will be able to learn about Voter IDs by just asking Alexa or interacting with Facebook Messenger. A voter for instance, might ask 'Alexa, what ID do I need to vote in Alabama?' , answer a few questions and get the answer. The Chatbot can also text them a link to print their own Voter Info card or transfer them to a human operator for more help. (Think of Chatbots as the digital equivalent of phone operators equipped with a list of common questions and how to answer them). Campaigns and advocacy groups can also use Chatbots for other applications. Imagine a candidate being able to explain his/her beliefs interactively to voters through Facebook Messenger or Amazon Alexa. You can learn more about campaign applications of Chatbots here. DemLabs works with progressive groups to tackle problems that'll also help other campaigns. We leverage the massive investment corporations make in software development for the benefit of progressives. This approach is faster and cheaper than developing new software and ensures that the solution is continuously refined, independent of the election cycle. Support our work by donating here. Thank you.